Kannabi means the place where deities reside. There are many Kannabi throughout the history of Nara Prefecture.Yamato Hongu is one of the Kannabi where deities are worshipped. Here, you encounter the deities, the people, and the history; in the end, you can feel like you have encountered your true self. This is the main shrine, Ontakesan Yamato Hongu, of the Ontakekyo sect of the Shinto religion which worships Mount Ontake in Shinshu Province as sacred. Since there is a historical account in this area of the Emperor Jinmu’s expedition to the East, we call this place Kinshi Shinen. When you are in Shinen (the sacred garden), you can sense the breath of the Gods, and when you remain silent and join your hands together in prayer, you can feel their presence deeply within your heart. This is the main shrine, Ontakesan Yamato Hongu , of the Ontakekyo sect of the Shinto religion. Shrines of this sect are located throughout Japan. Another name for the main shrine is Satono Sohongu. 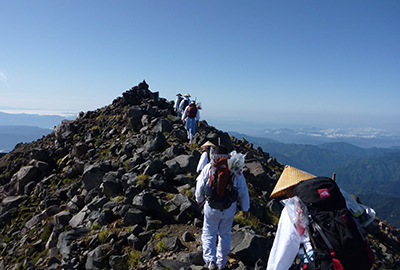 Since ancient times, people have climbed the sacred Mount Ontake for worship and ascetic practice. 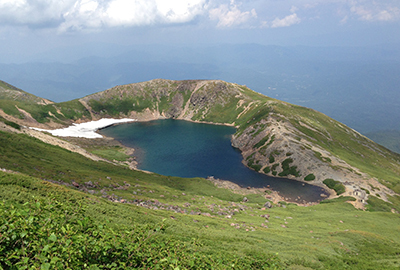 People called the deities that inhabit Mount Ontake, Ontake Okami. Believers worship the Ontake Okami and hold the mountain sacred. Through their worship, they hope to make the world a place of purity, enjoyment, light and peace. The practice of Ontakekyo is integrated into the lives of believers and is demonstrated by unselfish giving and a deep feeling of sympathy for others. Ontakekyo has no founder and is a religious organization that holds a deep respect for others. Ontakekyo became an independent Shinto sect by special permission from the Emperor Meiji on November 28th 1882. Ontakekyo is one of the leading faith organizations focused on sacred mountains and recently celebrated its 130th anniversary in 2012. Ontakekyo worships a deity called Ontake Okami , which is the unification of the Gods Kuninotokotachi no Mikoto, Oonamuchi no Mikoto, and Sukunahikona no Mikoto(featured below). Earth Creation Deity. The deity appeared at the time when the heavens and earth were created. Kuninotokotachi no Mikoto created all things and maintains the vitality of creation through divine power. This deity promotes mercy and harmonious relationships. Oonamuchi no Mikoto is considered the deity of prosperous agriculture, happiness, prosperity for one’s dependents and matchmaking. This deity gives people wisdom and talent, longevity, cures diseases and performs incantations. Faith in Ontakekyo venerates the power of the deity Kuninotokotachi no Mikoto and prays for the divine favor of Oonamuchi no Mikoto and Sukunahikona no Mikoto. Kakumei Reijin and Fukan Reijin were ascetics called Gyoja who are now worshipped as deities who received a sacred revelation and accomplished a great achievement by beginning the practice of climbing Mount Ontake for worship. There was a restriction to climb the mountain at that time (230 years ago), but it was lifted because of these ascetics indomitable conviction and pious behavior. The foundation of ontakekyo is selflessness and empathy towards others as taught by the Gods. These teachings are passed down from generation to generation and continues until the present day. Copyright © Ontakekyo All rights reserved.